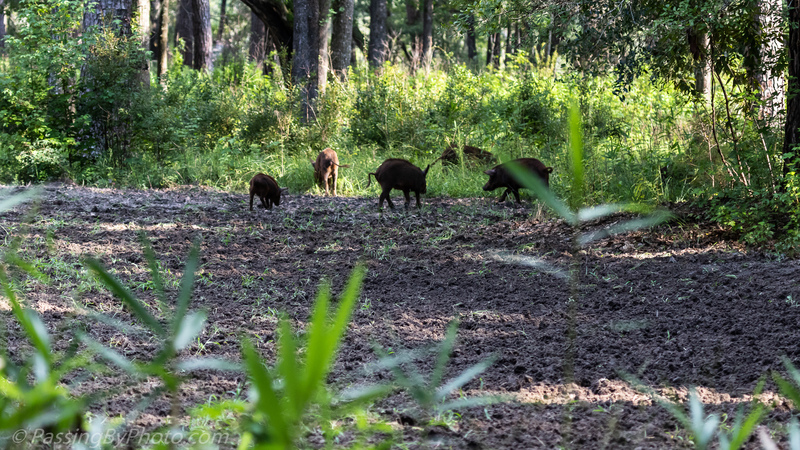 I have read about the damage wild pigs perform across South Carolina to crops, gardens, yards, anything they can root up, but this was the first time I had seen them in action. 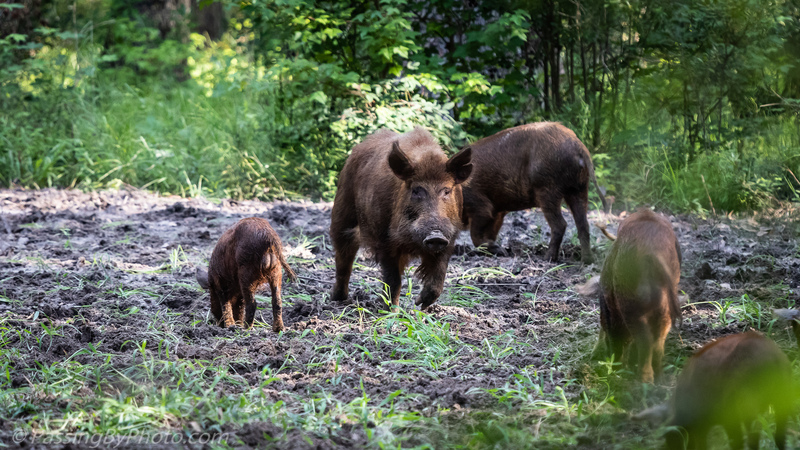 This was a group of about a dozen, appearing to be a boar, two sows and two groups of youngsters, at slightly different sizes. All of them except the boar were so busy feeding they didn’t even notice us when we stopped in the road. We had driven by this small field a few days before and the grass the Wildlife Management Area staff had planted earlier in the summer was up about eight or ten inches (20 – 25 cm) and fully covered this plot. 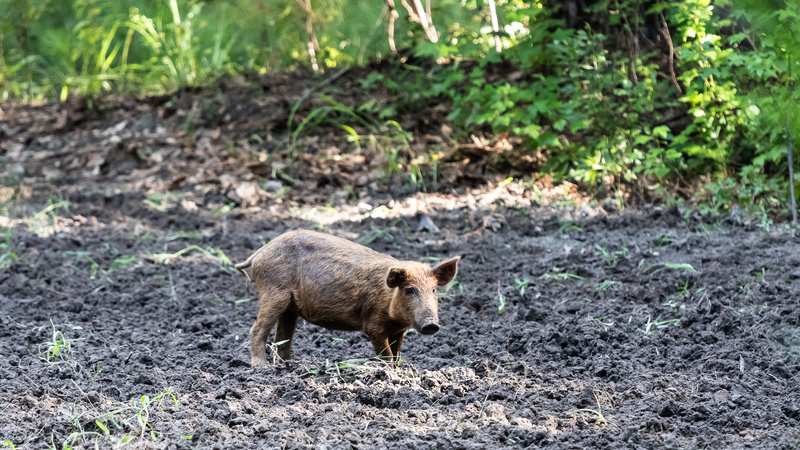 The WMA maintains a number of areas along the roads through the property that attract and support different kinds of wildlife. I don’t think this was the outcome they wanted: complete destruction. I suppose the good news is a little fertilizer left behind and freshly turned earth to accept new seed if they decide to replant. 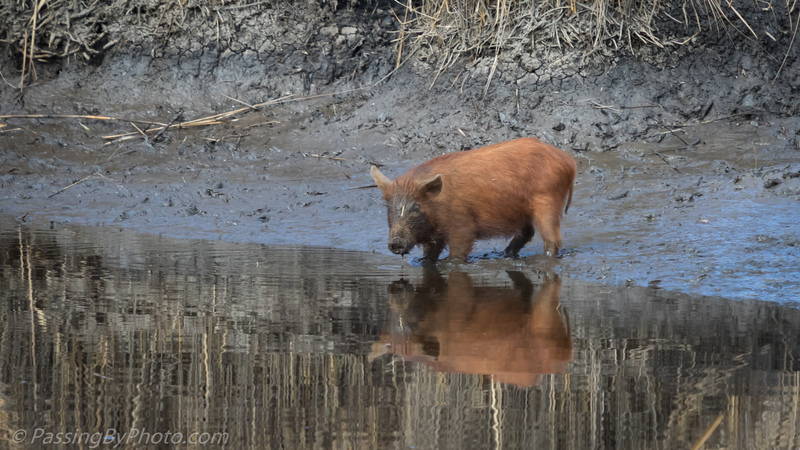 The boar had his eye on us and started encouraging his family to move along with some grunting and posturing. Off they went to destroy something else. 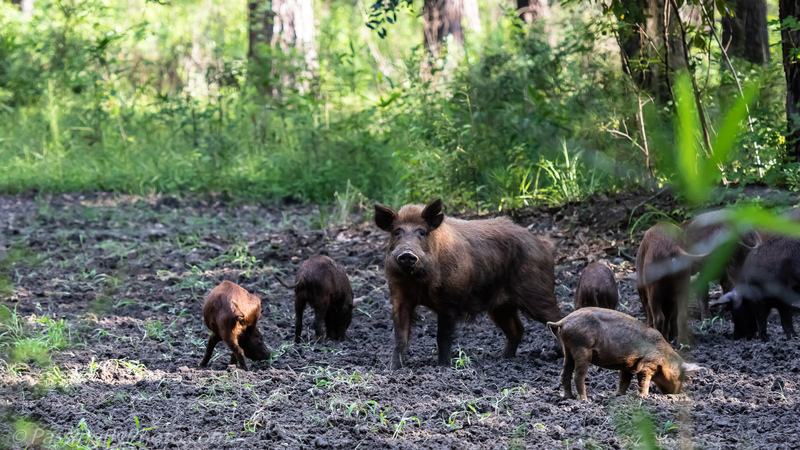 I’ve heard stories and read articles about South Carolina’s wild pigs, especially about how destructive they can be and how their population has exploded since the 1980s. 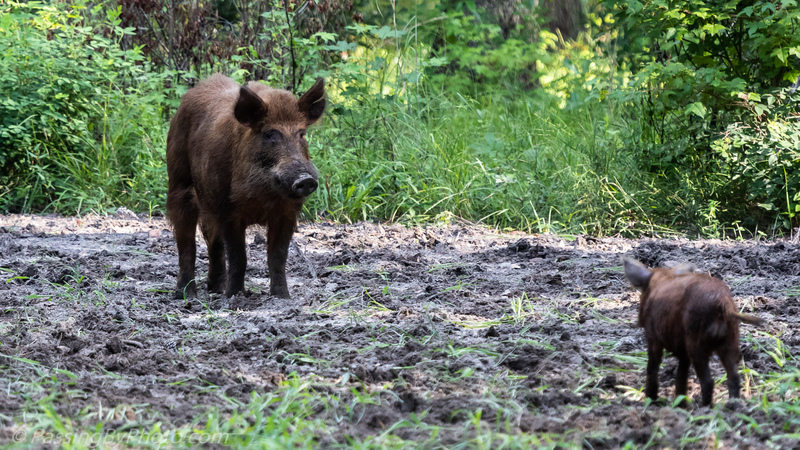 Depending on the source they may be referred to as hogs or boars. This is the first one I’ve seen and in quite an unexpected spot: a canal at the edge of an old rice field where I’ve often photographed egrets, herons and alligators. There is still a little snow around the edges of the ponds, some of the non-moving water is frozen over and the dense grass areas have ice in them. This may have been the best watering spot he could find, even with the mud. 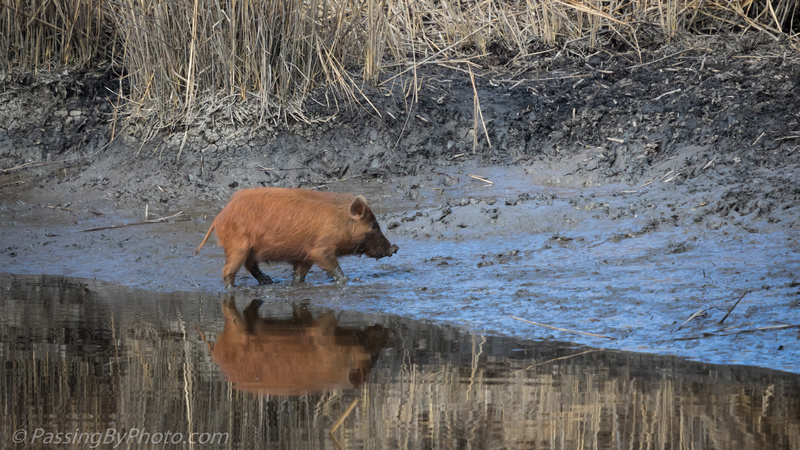 He sauntered away–I’m not sure he could have run if he needed to, being up to his knees in that mud. 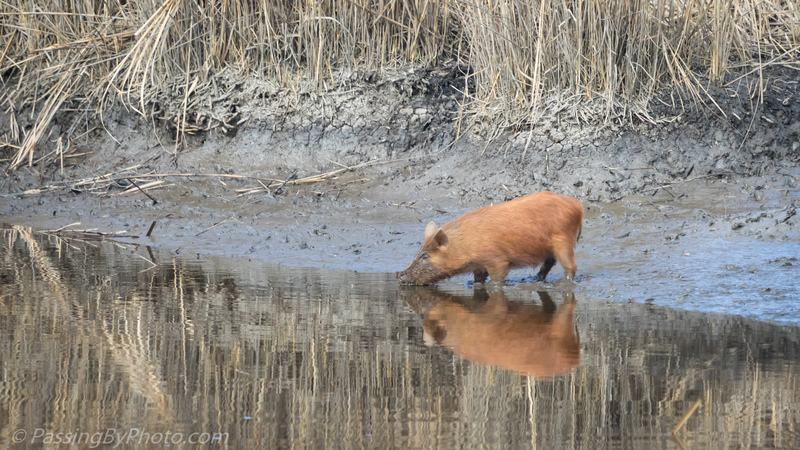 There is not much going on at the marsh areas we visit. The summer heat if full force and nesting / family rearing season for the birds that breed here has ended. A Sunflower and a Turkey Vulture were my best photographs of the day. 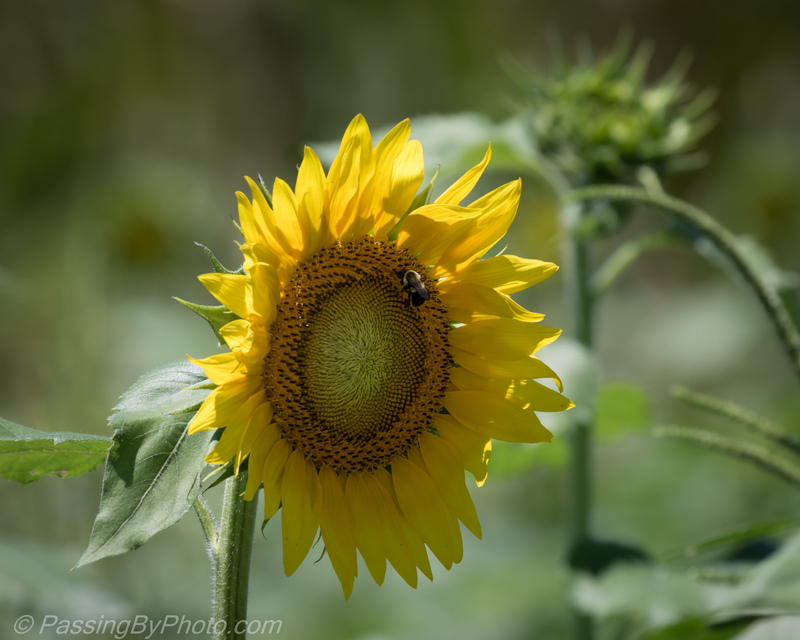 The Sunflower in a field planted by the Wildlife Management Service was hosting a bee. 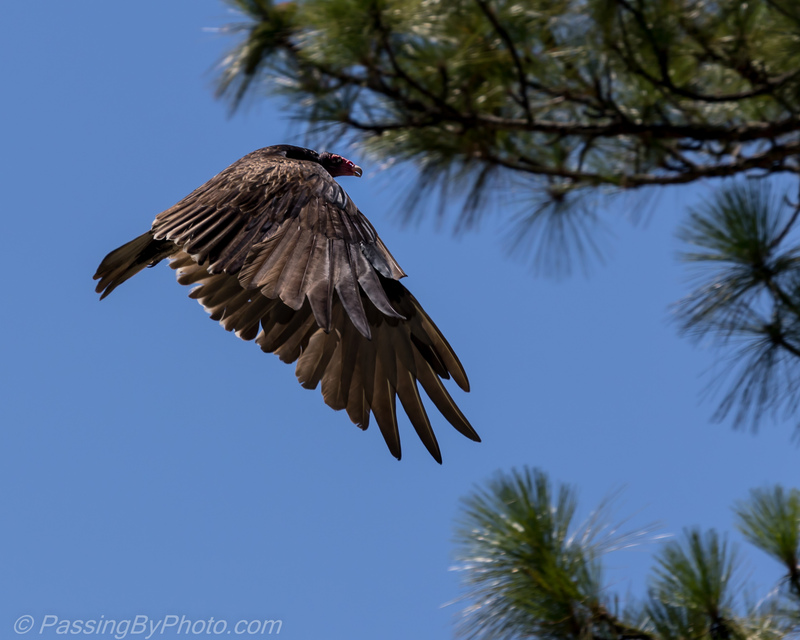 The Turkey Vulture had been working on road kill clean up duty and circled around as we passed by. Masters of wind currents they are beautiful in flight, if not at all glamorous close up. Even on this short flight his turning skill into the pine tree was impressive. 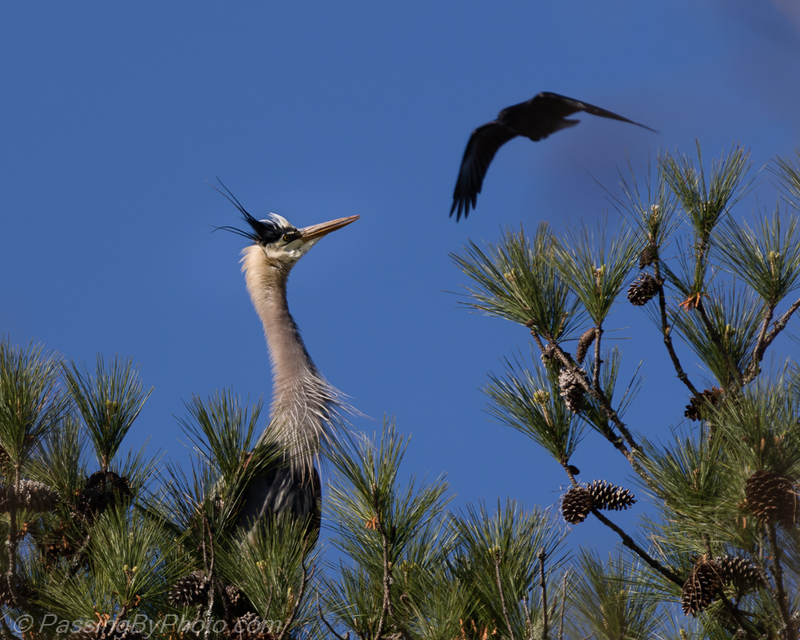 The Great Blue Heron was peacefully surveying his realm from atop a pine tree until a crow spotted him. The Heron’s head feathers stood up on alert and after the crow’s third pass he flew off to a lower perch. An educational trail sign says the rabbits in the swamp are Marsh Rabbits. This is as good a look as I’ve gotten and I’ve read that the Marsh Rabbit is a strong swimmer. He’s on a small island in the flooded marsh so it seems to fit. 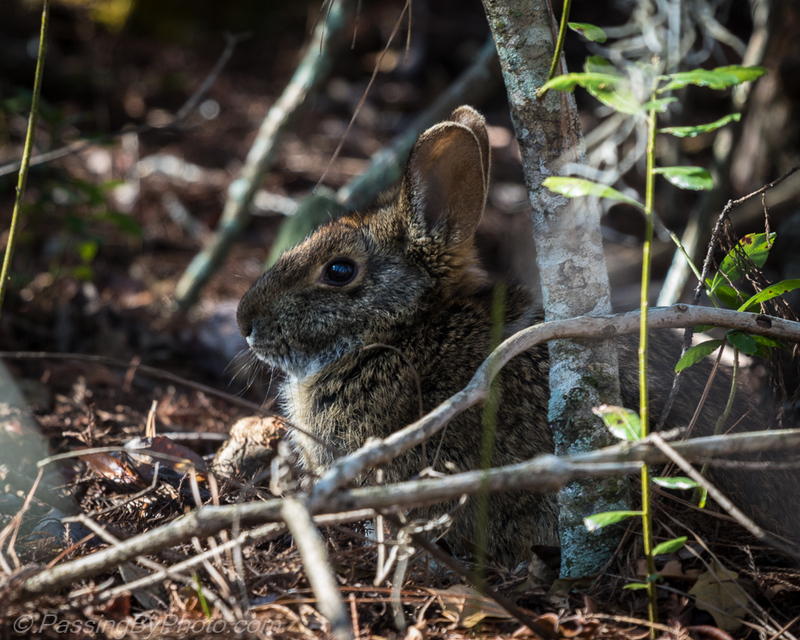 The other possibility would be an Eastern Cottontail, but he was not moving to show his tail while I was watching. 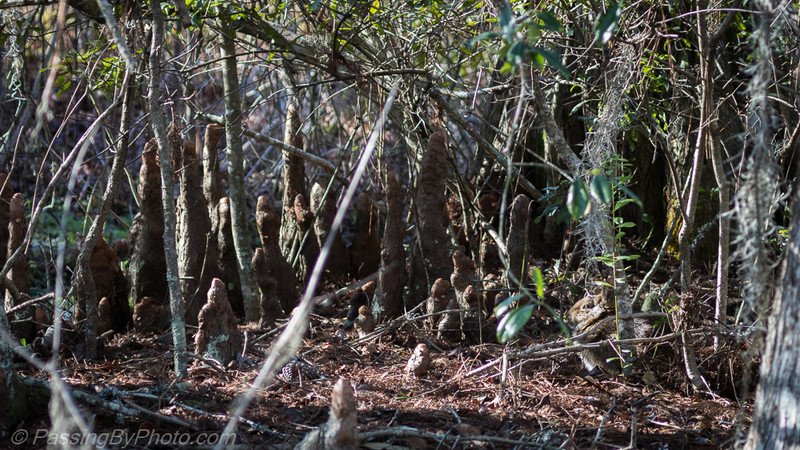 He was well camouflaged among the Cypress Tree knees. Audubon Swamp at Magnolia Gardens, Charleston, SC. 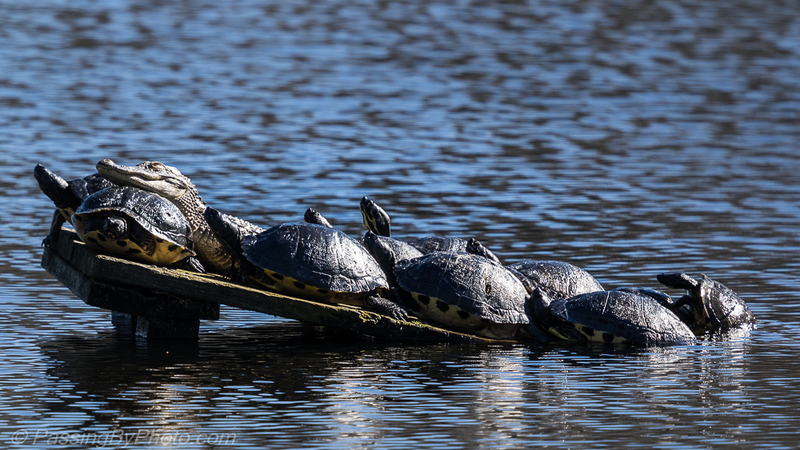 On Sunday I posted photos of turtles posing on an Alligator ramp and logs to sun themselves out of the water. 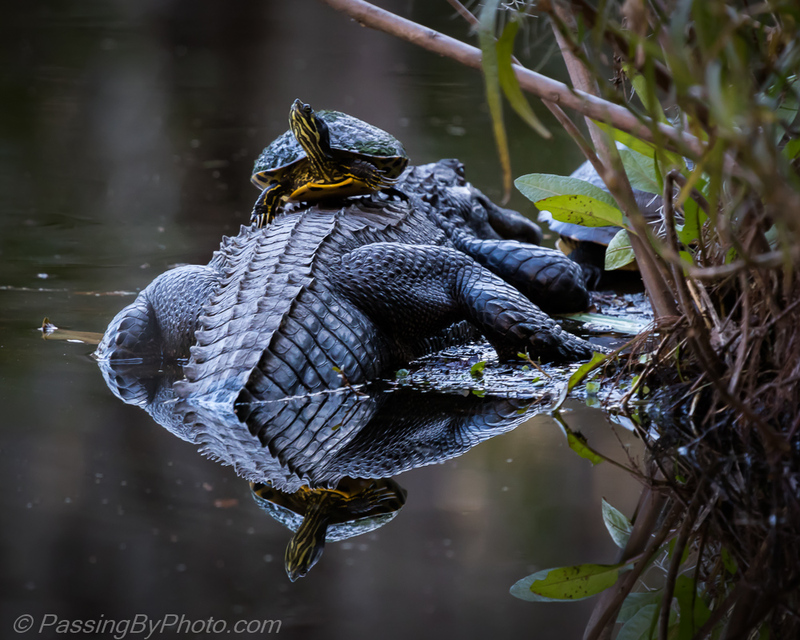 Yesterday in the same spot an Alligator was using a turtle as a head rest and more turtles were clambering to join the group. Further along in a different pond a similar activity was taking place with a much larger Alligator, only this time the turtles were on top. Do they have no suspicion that they might be lunch? 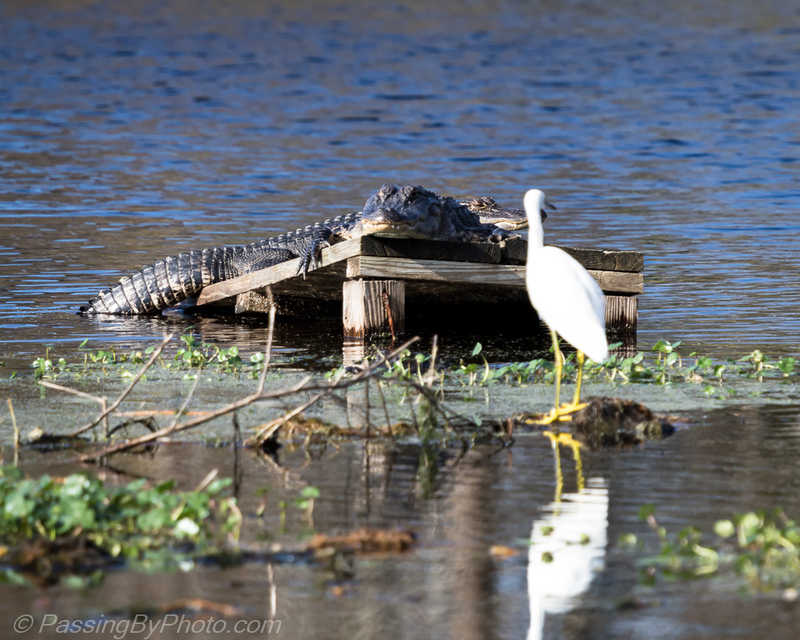 We returned by this spot about an hour and a half later to find the Alligator had changed position but at least one free-loader was still in place. 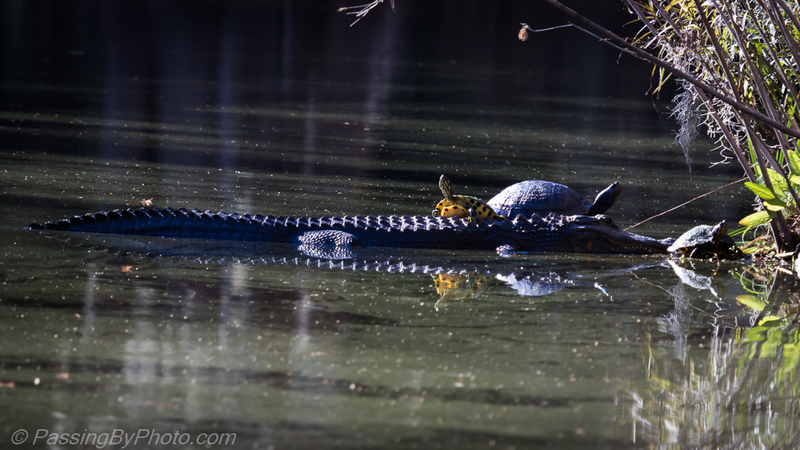 The nature guide at Magnolia Garden identifies these turtles as Yellow-bellied Sliders. Hey, Ralph, did you see something move? Ralph? Hey, Ralph, where did you go? 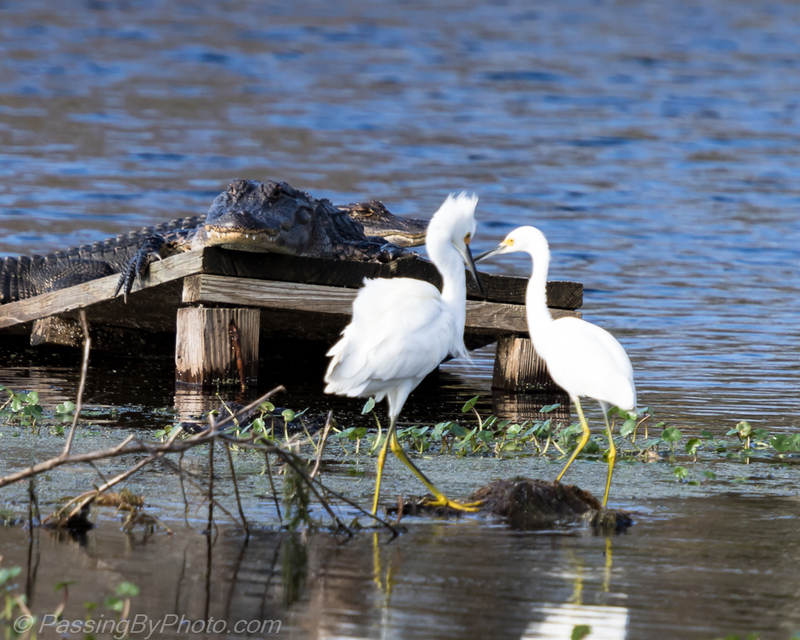 It is amazing how the wading birds seem to pay so little attention to the alligators–how do they know it isn’t lunch time? Their heads did all snap around when a Bald Eagle flew over. 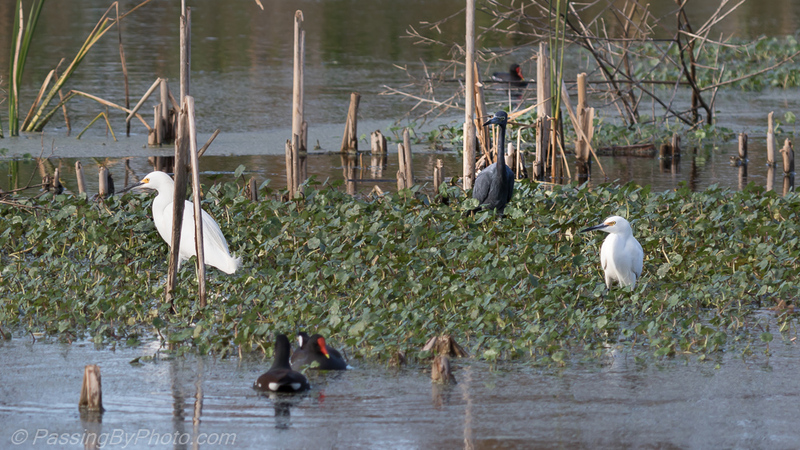 One Roseate Spoonbill perched in a tree above a pond full of Alligators. I stopped counting at 60 and I’m sure there were more hidden in the reeds and along the banks. 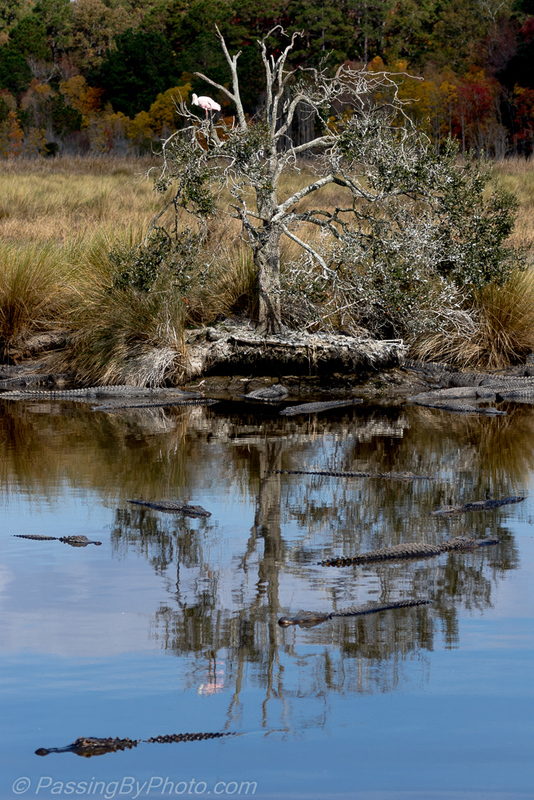 From a distance the alligators looked like logs bobbing in the pond. Most of them didn’t move much but make no mistake they were alive. 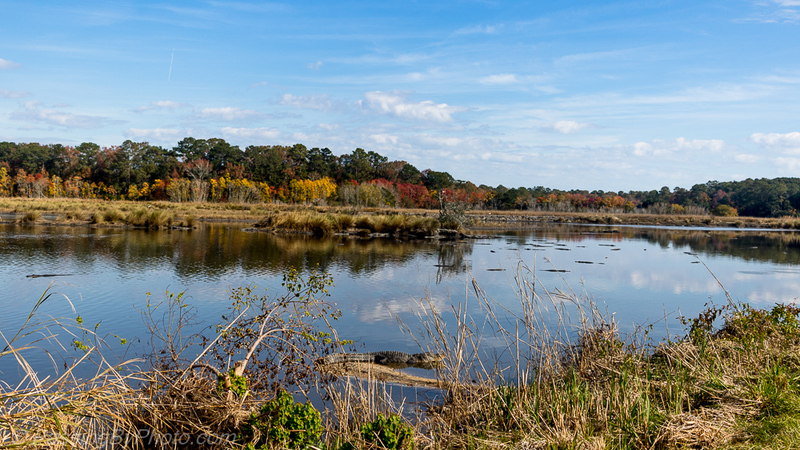 Donnelly Wildlife Management Area, Colleton County, South Carolina, 11/25/2016. 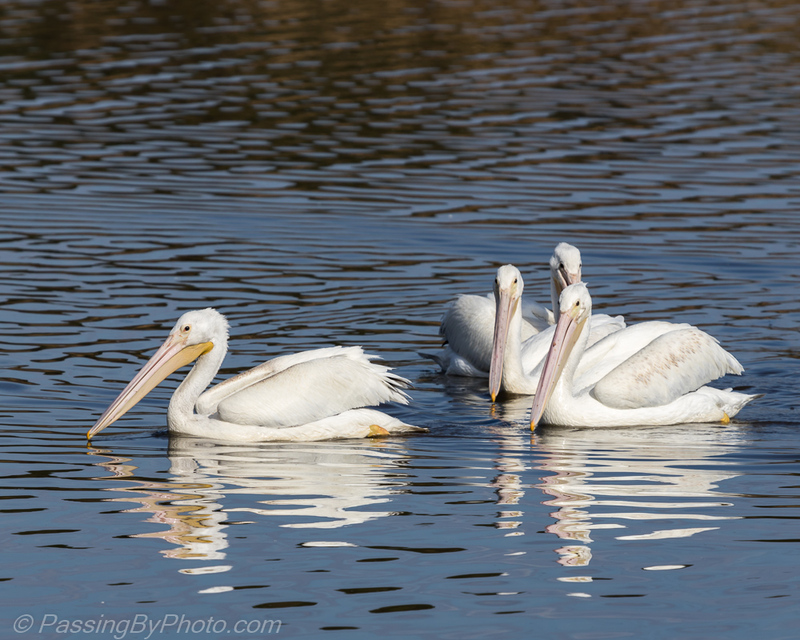 This group of four American White Pelicans swam round and round for over a half hour, occasionally using their bills to scoop food. 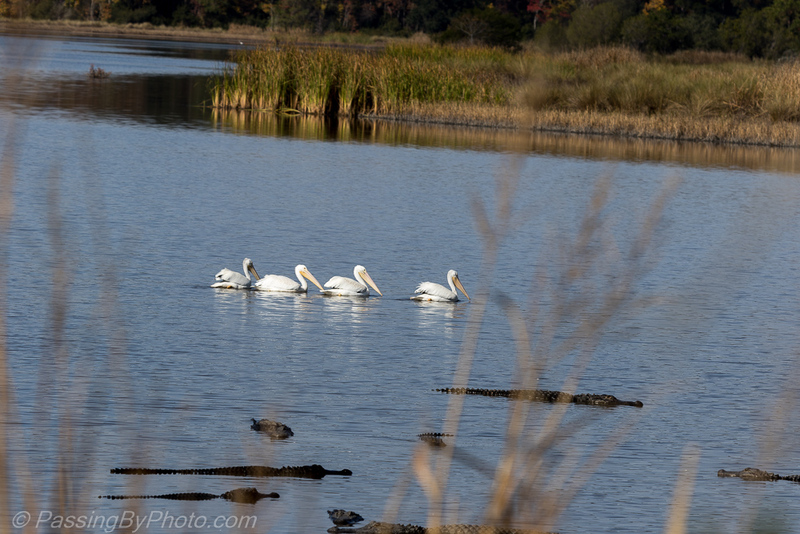 They seemed oblivious to the alligators floating nearby, but did mostly stay in a tight group, perhaps for safety. 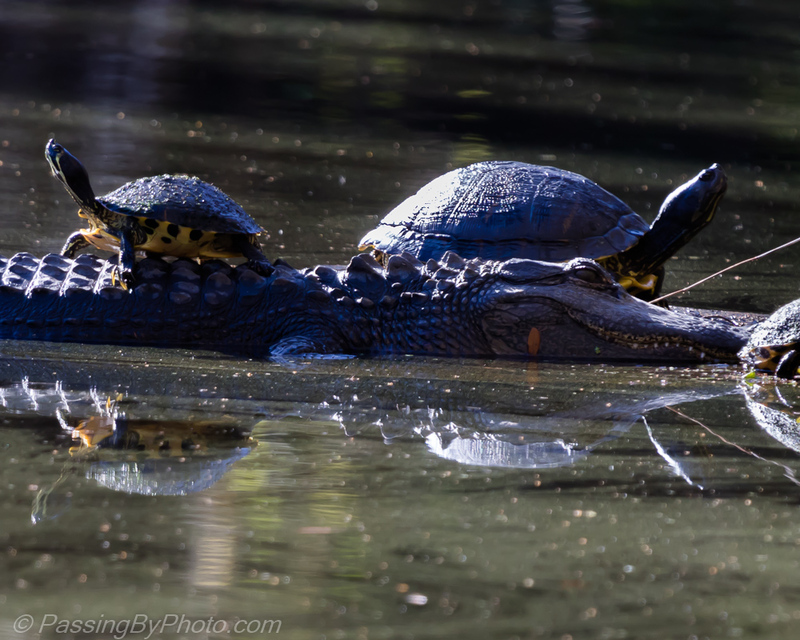 The reptiles were not moving much and were clustered near shore. It was hard to see how deep the water might have been and how that might have affected both the birds’ and the alligators’ movements. 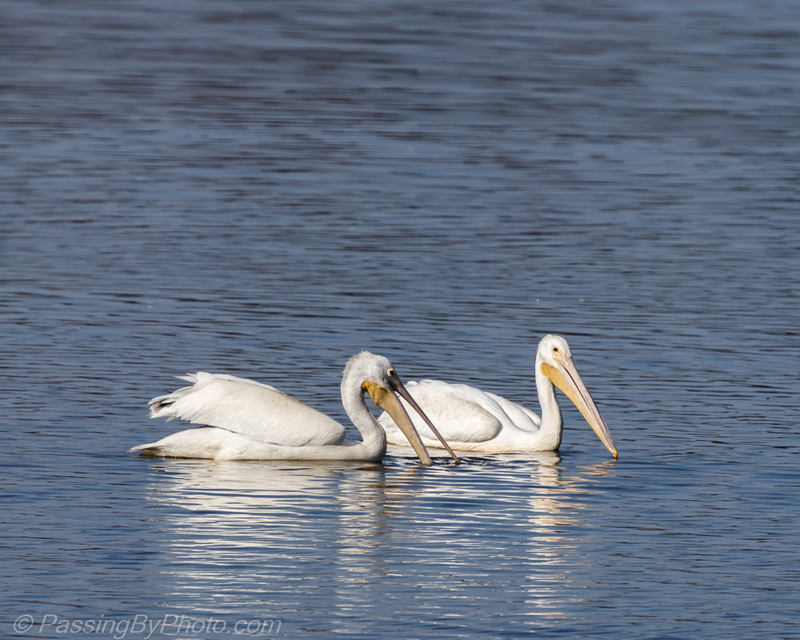 I was hoping the Pelicans would display their flight skills, but they just continued round and round, eventually disappearing beyond the bend in the pond. Donnelley Wildlife Management Area, 11/25/2016. 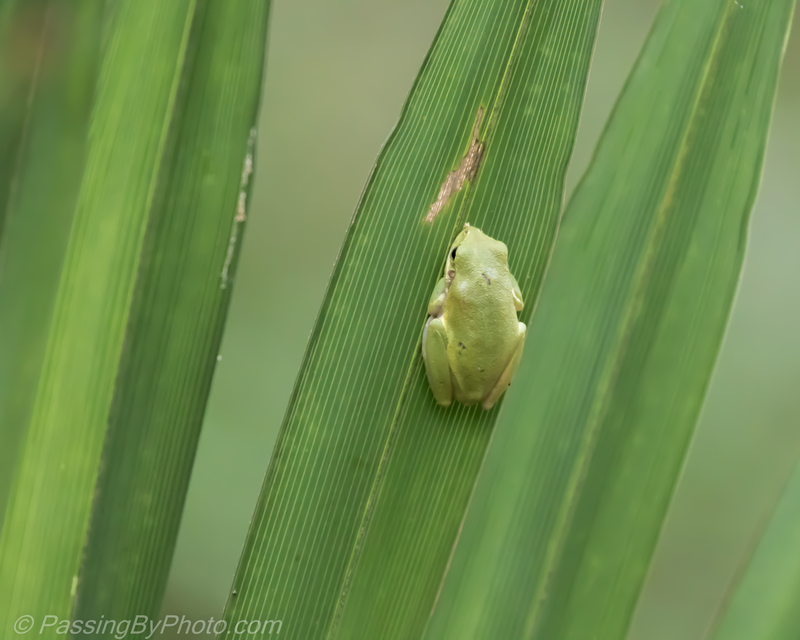 Holding still and blending in are two great ways to stay hidden. 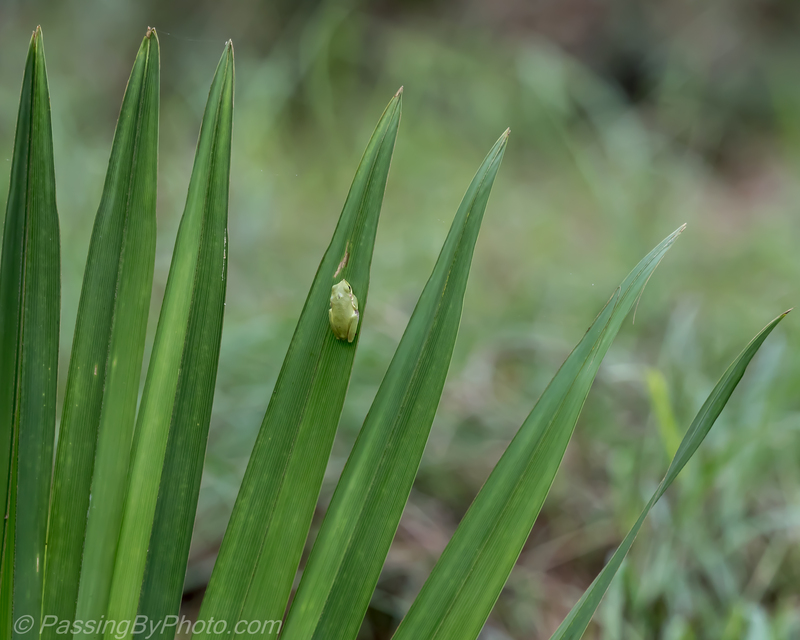 This frog did both, never moving in the five minutes I watched him. His skin appeared extremely smooth; if he had lines like the leaves I might not have seen him.